Research on drop impact on solid surfaces has primarily focused on the impact of a single-phase drop. However, drops consisting of multiple immiscible fluids occur in many industrial applications, such as combustion or steel strip manufacturing. In our study we investigate the impact of a compound drop on a glass substrate, concentrating on the representative case of a core water drop inside a silicone oil shell. Several effects are observed during the impact of a compound drops on a solid surface, such as horizontal splashing of the oil shell, and the formation of a vertical, singular oil jet when the inner water drop retracts; remarkably, we observed that the oil shell acts as a lubricating layer upon impact, promoting either full or partial rebound of the inner water drop from the hydrophilic glass substrate. We have mainly focused on the parameters affecting the rebound of the core drop, including volume ratio (water volume to total volume) and impact velocity. It was found that both a minimum and a maximum velocity exists for which (partial) rebound of the water drop is observed. Impact of a water-in-oil drop on glass. 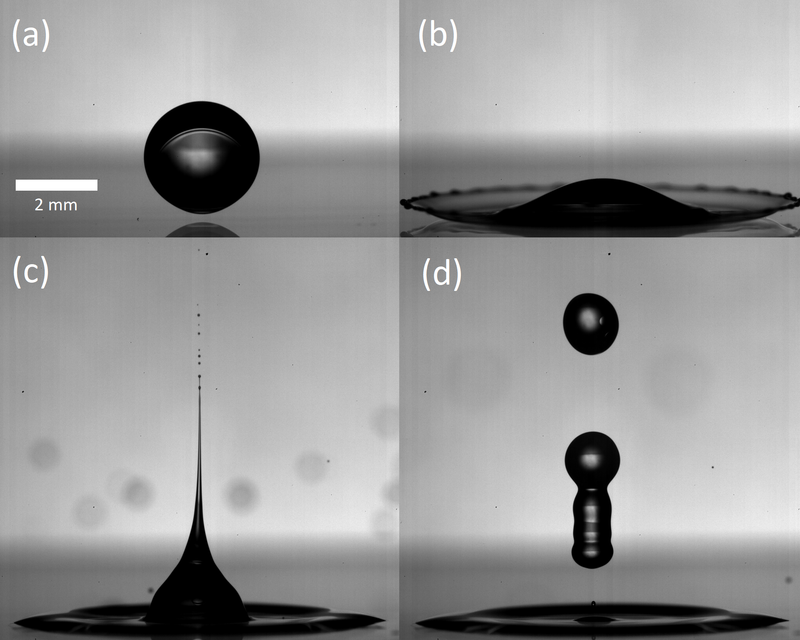 a) Just before impact, b) onset to horizontal splashing, c) vertical oil jet, d) rebound of the inner drop. Images from a single impact.